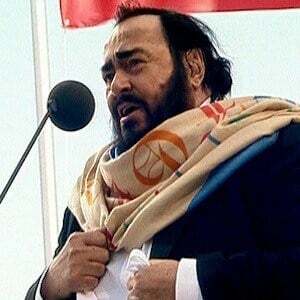 Italian operatic tenor best known for his performances with Spanish singers Placido Domingo and Jose Carreras. Together, they were given the name The Three Tenors. After moving to the countryside during World War II, he developed a keen interest in farming. He debuted as an opera singer in La bohème as Rodolfo in 1961. He was the recipient of the Kennedy Center Honors in 2001. He married Adua Veroni in 1961 and, after their divorce in 2000, he was remarried to Nicoletta Mantovani on December 13, 2003. He hosted famous artists such as Mariah Carey at his annual Pavarotti and Friends charity concerts.